I noticed my legs getting warm when sitting at my desk yesterday and noticed that the pc seemed to be producing hotter air than normal. 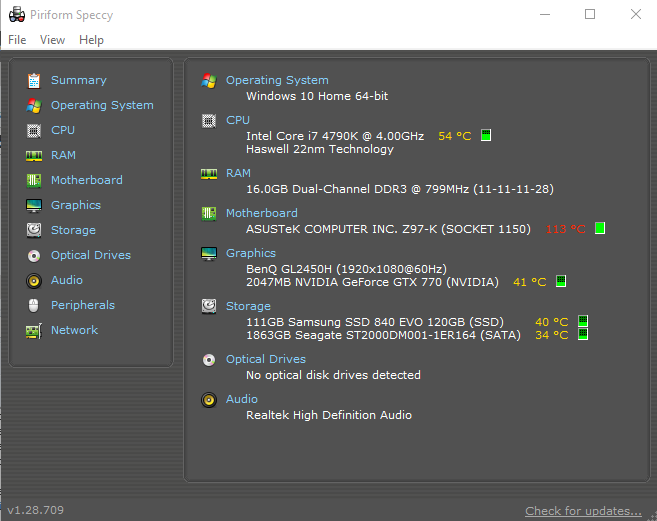 I downloaded speccy and apparently my motherboard is running at 115degrees celcius. This surely can't be right... wouldn't it melt? Or my pc just turn off to stop it catching fire? I thought it might be a false reading from speccy so I tried HWMonitor and SpeedFan and they both say the same thing, so could it be that my motherboard is what is giving the false reading? The reason I think it's a false reading is because when I turned my pc off that night and turn it on in the morning (about 8 hours of being turned off) and instantly loaded up speedfan and it said my motherboard temp was 110degrees celius... but how can it be? Yup.. something is off in the reading.